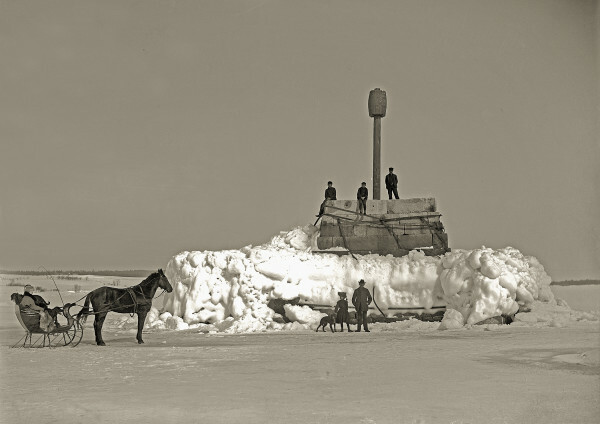 During the cold winter of 1904-1905, Mainers enjoyed taking horse-drawn sleighs across the frozen expanse of Belfast Harbor to check out the Monument, a nautical marker that is at least a half mile from land. 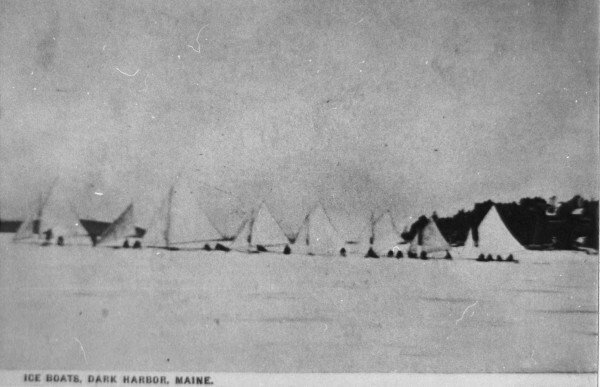 Carver's Harbor was frozen solid in 1918, with six Friendship sloops and some power lobster boats locked in the ice. The island was struggling after being icebound for more than a week, but were able to send a telegram to President Woodrow Wilson to ask for help. Then an ocean-going tugboat was able to get through the "ice blockade" to bring in food for the people and animals on the island. 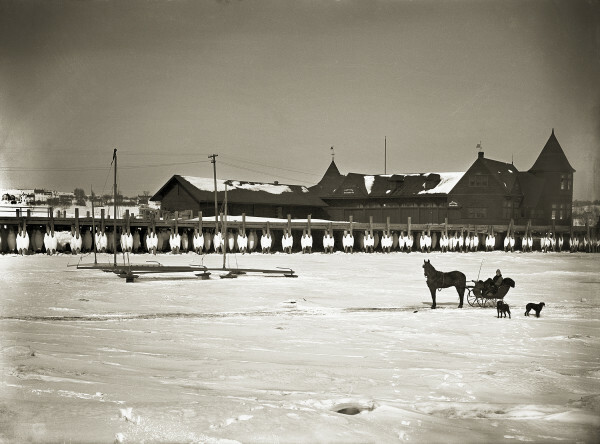 A horse and sleigh pause for a moment while on an excursion across frozen Belfast Harbor during one cold winter in the early 1900s. 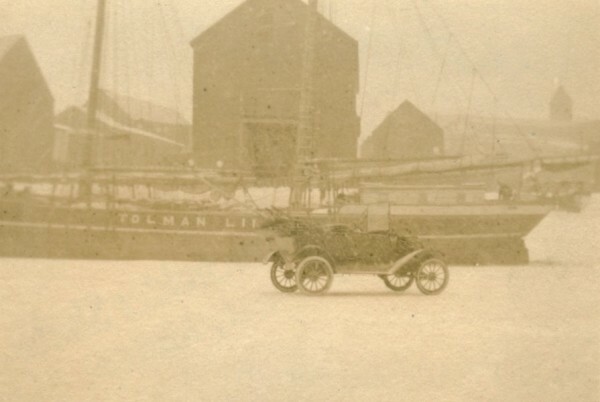 Behind the sleigh is the Eastern Steamship Wharf, where the Belfast Boathouse is today. 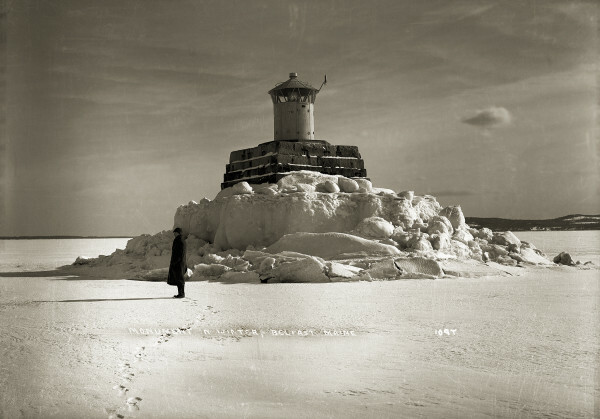 A man stands in front of the Monument during one cold snap in the early 1900s that caused Penobscot Bay to freeze up. The Monument, which marks Steele's Ledge at the entrance to Belfast Harbor, is about a half mile from the shore. Winter sports have always been important in Maine, and today you're likely to see an occasional ice boat speeding along on a frozen lake. But how about a fleet of them on frozen salt water? 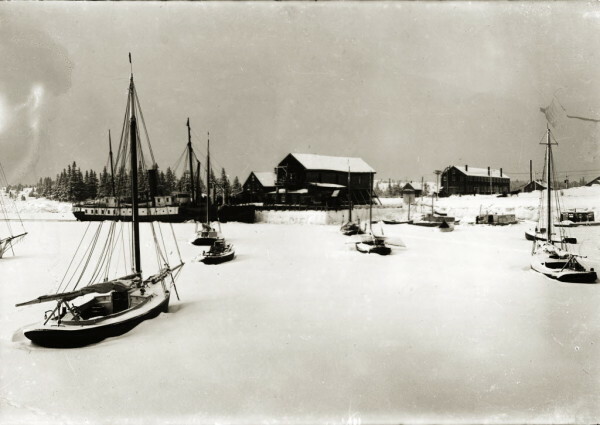 That was the scene captured by this early photograph in Gilkey Harbor on Islesboro. Quite a sight, and one not likely to be repeated. Captains Perry and Leighton Coombs used to pilot steamboats around Penobscot Bay, including stops at Islesboro, Castine, Belfast, and Camden. 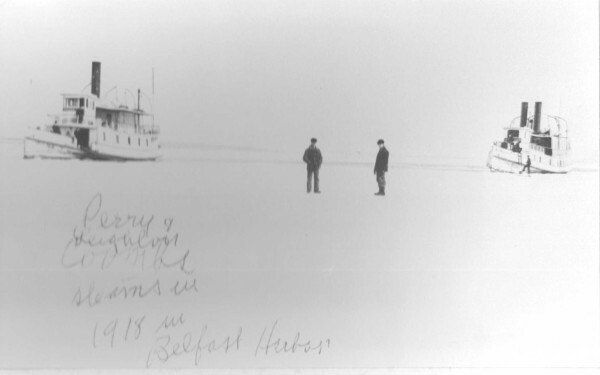 This photo shows the brothers standing on frozen Belfast Harbor with the steamers Golden Rod and Silver Star in the background. In the early 1900s, enterprising Mainers harvesting ice in frozen Penobscot Bay use teams of horses to cut grooves into the ice. This Ford Pathfinder was the first car to make the trek across the frozen expanse of Penobscot Bay from Castine to Belfast in 1918. Horses and men work to help the United States Revenue Cutter Levi Woodbury cut a channel in the ice in Belfast Harbor that formed during the winter of 1904-1905. ROCKLAND, Maine — With the average temperature in the first half of February measured in Bangor at 4.7 degrees, and 100 inches of snow burying Washington County, it has been a cold, hard winter for all in Maine. But just like the old-timers say, winters used to be worse. No one knows how tough it is right now more than Chief Marc Moore of the Coast Guard Cutter Tackle, based in Rockland Harbor. During the winter, his ship breaks up the ice that has formed in shipping harbors, such as Searsport and Bucksport, and goes up the Penobscot River as far as Brewer. But this year, he’s had to spend more time closer to home. “This is the first time in years that Rockland Harbor actually froze solid, with about four inches of ice,” he said Wednesday. The cold, snowy conditions have meant that when Moore’s seven-person crew takes the Tackle up the Penobscot, their work is cut out for them. The river now has a layer of ice covered by a foot and a half of snow — covered by another layer of ice and another foot and a half of snow, Moore said. The Tackle has spent the last two weeks trying to break up the thick mass that re-freezes overnight. Yet despite the thickness of the river ice, the cold, and the back-to-back storms, this year still cannot compare to notable times in the past when long stretches of sub-zero weather caused the entire upper Penobscot Bay to freeze up. Unlike freshwater, which freezes at 32 degrees, seawater needs to be 28.4 degrees before it will freeze. Sean Birkel, the new Maine State Climatologist and an assistant professor with the University of Maine Climate Change Institute, said that upper Penobscot Bay used to freeze once or twice a decade during the 1800s and until the early years of the 20th century. One notable and long-lasting cold snap in 1915 caused the bay to freeze up as far south as Rockland and as far east as Deer Isle, a distance of 20 miles as the crow flies — but 80 miles by road. Birkel said the icy isolation was hard on islanders, and even mainlanders who lived in remote locations, who were accustomed to having easy access to trade via ship. “In years in which the bay froze over, it posed particular challenges,” he said. The first time someone drove across the frozen bay was on Washington’s Birthday in 1918, when Captain Albert Gray traveled from Harborside to Belfast in his Ford Pathfinder. 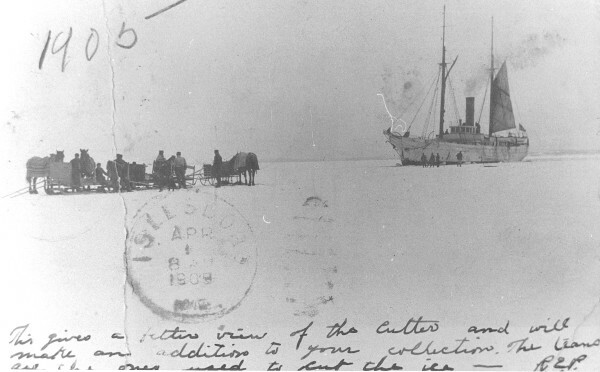 A newspaper account from the time said that Gray and his companions cut a hole in the ice every now and again to see how thick it was. 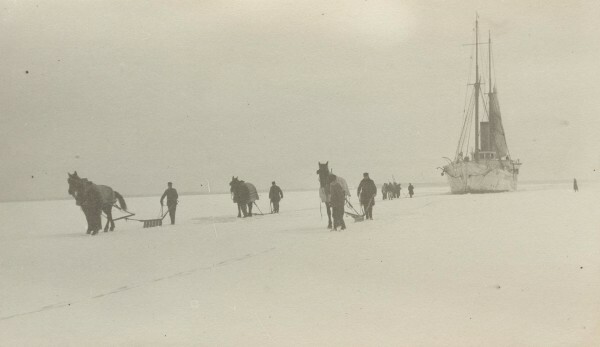 After that adventure, driving across the frozen expanse of the bay became commonplace that winter, with people hauling grain and provisions and making the 12-mile journey in about half an hour. Barbara Dyer, a 90-year-old Camden historian from Camden, said that as a teenager in 1916 or so, her father took advantage of the deep freeze that turned open water into ice. The bay has iced over in more recent years, too. In 1934, when 20 of 31 days in January had temperatures no higher than zero degrees, the ambient temperature dipped as low as 38 below zero, Pinette said. One enterprising auto mechanic drove cars over to Islesboro and then sold them to the islanders. Captain Richard Spear of Rockland, who is 93, said he remembers that big freeze well. Mainers were surprised in February 1971 when a Coast Guard helicopter found that Penobscot Bay was “frozen 100 percent from the mouth of the Penobscot River to a line from Rockland to North Haven,” the BDN reported. At that time, Coast Guard vessels were summoned to free coastal tankers, tugboats and fishing boats trapped in the ice. Dyer recalled that February watching a lobsterman use a little Yankee ingenuity to check on his boat, which was frozen in Camden’s inner harbor. Since then, there have been no major freeze-ups in the bay. So what happened? “In general, for the bay to freeze over, there has to be cold overlying air,” Birkel said. Maine’s average annual temperatures have increased by three degrees Fahrenheit since 1895, he said. In the late 1800s, the weather around Bangor was as cold as winters are now in Caribou. A number of factors contribute to the rising temperatures, he said, including natural factors, such as solar activity and volcanic activity, and man-made factors, including increased greenhouse gases. The warming ocean surface temperatures in the North Atlantic have led to more evaporation and helped create the unusually large amount of snowfall this year in New England, he said. But it hasn’t been cold enough long enough to freeze Penobscot Bay.